This is a common question I receive from numerous clients while they are in the planning stage for the perfect party. A very valid question because having too little will result in a party fail and having too much will force you to start scrounging around your kitchen for enough containers. What do you do with all of the leftovers… give them away? While it is a nice touch giving parting gifts, this certainly isn’t cost effective and can be a point where money could easily have been saved. To cut down on giving away your disposable food containers and spending too much money, find yourself a caterer that can really assist with planning for the perfect quantity. I recommend you start by asking yourself these questions and hopefully your answers will help you convey your guests needs to your caterer. Who’s coming to my event? Identify your guests. How many adults, how many children, of those children, are they under the age of 5, or are more of them between 6-12? Knowing who is coming to the event, and for children, knowing their ages, can be extremely helpful during the planning stage for an event. The general rule I tend to follow is for every 2 kids between the ages of 6-12 they would eat the equivalent of 1 adult serving. Children under the age of 5 are eating little portions off their parents plates so theoretically they won’t need to be included in your guest count given to your caterer. Am I the only one supplying food or are others bringing side dishes? While this is an easy question to say yes or no to, the answer will have a drastic impact on how you should proceed with factoring quantities of food. If you are the only one providing food, this will help the end result of reducing leftovers. When a potluck approach is taken, I advise creating an online signup sheet and sharing it with your guests. They will be able to see what other people are bringing which will then eliminate the possibility of the dreaded 4 potato salads arriving. While supplying one meat option is perfectly fine you should order 100% of the guest count as you won’t want to have a guest not receive the main entree. A second meat will provide more options to your guests, however you now need to factor in the possibility that guests might end up taking both meats. To gather this count, I recommend taking the guest count, divide by 4 and then multiply by 3. By doing this, you’re allowing for 75% of your guests to have the option of taking both. Now for the easy part, tell your caterer what menu items you want them to provide, and they will take the information from the above questions into account. 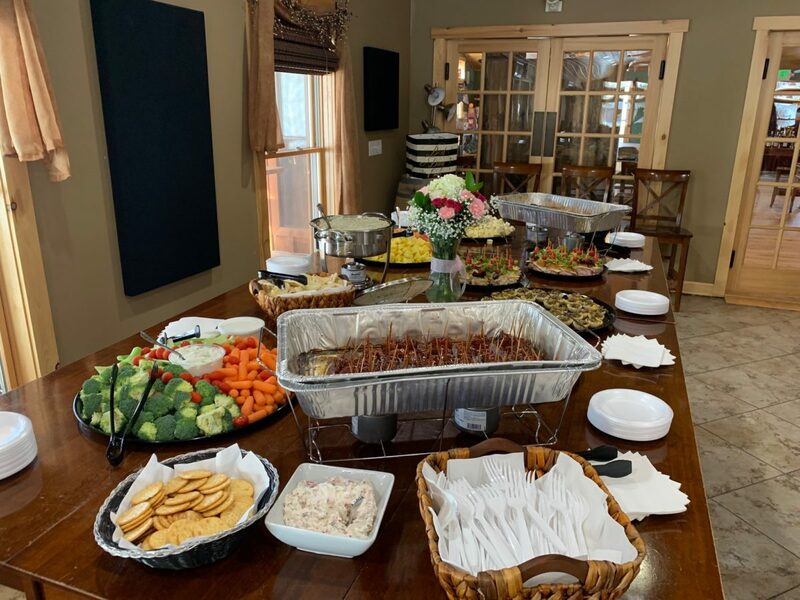 Generally stating, not everyone will take every item, nor will people take the full allotted serving portion so basically this just means that if you have 50 people attending your party, you don’t need 50 servings of every item. Using this example menu above, I applied the 75% aspect to the sandwiches, giving 75% of your guests the option of having both sandwiches. While most people like baked beans, most people only want a little portion, the 30 servings will then stretch to feed all 50 people if need be. For the macaroni & cheese and cornbread, let’s face it, these items you really cannot have enough of because everyone loves them! Hopefully this helps you understand, from a catering perspective, how we can assist you in ordering the right quantities of menu items for your next event!